Hey everyone, Nick (NP) here. I shoot photos. I do other stuff too, but mainly that's it. I like to shoot people. Not literally though. With my camera. Yes, my camera is officially called the "Hammer of Thor"
If I had a dollar for every person that read this, I'd have $6.25. I have a cool dog. A big thanks to Brian for setting this whole thing up. I've got to say I'm pretty excited to see everyone's photos. Good luck to everyone! Do people ever stop and talk to you while you're out taking taking photos? But I love how half of the picture is blurry. Does your lens do that or did you edit it to do that? Yeah, people have stopped to ask me why I'm taking photos of them. Just tell them the truth, seriously. One thing that helps with candids is to pretend to take a picture of the landscape (or whatever else) and then snap the photo when they walk by. Tim once pretended to take my portrait to get a guy behind me. 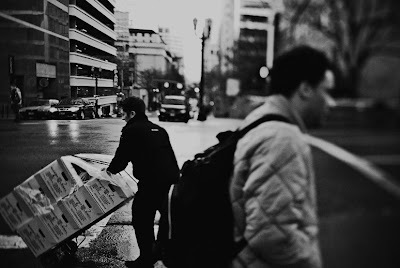 In this case, I saw the delivery man from a block away, so I set up where I knew he was going to be walking, and pretended to be taking pictures of the street. My eye was in the viewfinder as he walked by, so he didn't expect anything. Really, it was luck that the backpack guy walked by at the same time. And the blur is natural, from the tilt-shift. Great capture. I love the tone of the picture...you can practically feel the rush of people walking, or feel the gray, damp weather. Great advice for shooting in public! What do you think of getting permission before you take the picture? I have a shot that I would love to upload to Flickr to get some suggestions on, but I didn't even make eye contact (give a nod,point to the camera, etc.) to let the person(s) know that I was taking their picture. Should I still be able to post it online? Keep up the project! I'm loving it. This is awesome Nick I love it! If you take someones photograph(showing their face) that's not illegal as long as it's in a public place. It's just more polite to ask. But If you were to sell that photo(showing their face and not telling them and not having a signed legal document)and make money on it, that's illegal. And(if they find out)you'll be sued for so much money it's not even funny. Now if you can't see the people's faces like in nick's photo that's totally legal, he could also sell it if he wanted and can't be sued cause you can't see their faces. Basically It's a great big grey area. Now if your on private property your on a whole other ball field. I came, I read, and I thoroughly enjoyed!!! Awesome... I'm a rich man.